Serbia’s main power plant is being threatened by the worst floods in the Balkans for decades, officials say. The River Sava has burst its banks in many areas and water levels are expected to peak later on Sunday. At least 20 people have died in Serbia and Bosnia-Herzegovina after a month’s worth of rain fell in three days, and the death toll is expected to rise. In Bosnia, landslides have buried houses and disturbed landmines laid during the war in the 1990s. The floods are also affecting Croatia. In Serbia, thousands of residents in Obrenovac were moved to safety after much of the town was inundated. The town, south-west of the capital Belgrade, is home to the Nikola Tesla power plant, which supplies much of the country. Serbian PM Aleksandar Vucic said that his government’s primary concern was to protect the power plant. “We are doing all we can,” he said. Thousands of volunteers have responded to the government’s appeal to build up flood defenses along the Sava. Serbian tennis player Novak Djokovic also appealed for help. “Support for everyone! Let’s help those in danger! Join the aid action!” he wrote on his Twitter account. 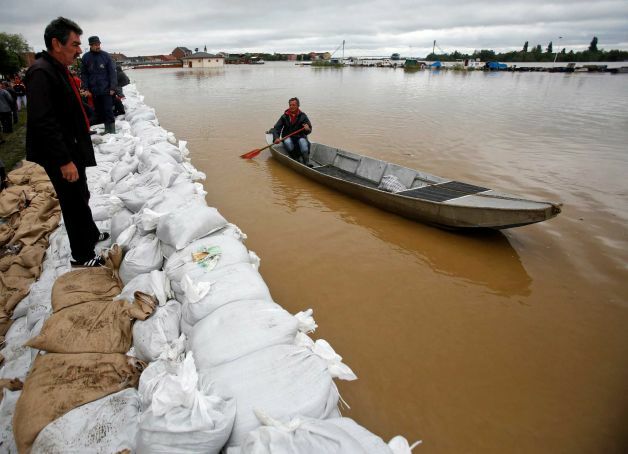 Officials have refused to give a death toll for Obrenovac until the floodwaters recede. Almost one-third of Bosnia is under water. The north-east is worst affected, with houses, roads and railway lines submerged. Bosnian Serb police chief Gojko Vasic said the situation had been particularly difficult in Doboj “because the flood waters acted as a tsunami, three to four metres high”, the Reuters news agency reported. Bosnian Security Ministry spokesman Admir Malagic said that about one million people – more than a quarter of the country’s population – live in the affected area. Chairman of the Bosnian three-man presidency Bakir Izetbegovic said that his country is facing a “horrible catastrophe”, the Associated Press reported.